Beautiful custom stairways, railings and banisters - Traditional StairWorks Inc. While a staircase may be required structurally to access additional floors on your property, it does not mean that you should settle for a basic, cookie-cutter design. A custom staircase, when properly designed and built, adds a certain artistry to your space. The experienced contractors at Traditional StairWorks, Inc. are skilled at designing and installing unique custom staircases. A staircase may be required structurally and to move from floor-to-floor in a building but that does not mean a simple lackluster or cookie-cutter design must be settled for. Custom stairways are a work of art that add style and value to any interior space. 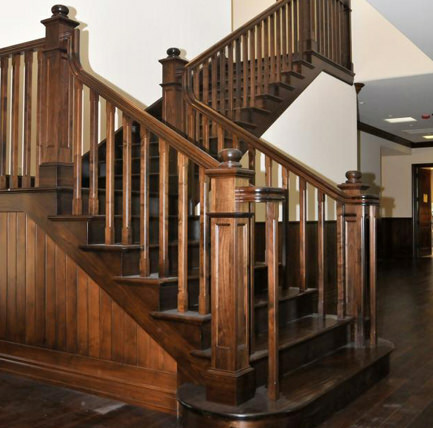 The experienced craftsmen at Traditional StairWorks, Inc. are skilled at designing and installing unique custom staircases that upgrade the look of any room that requires a set of stairs. Working with Traditional StairWorks is easy because they are passionate about their work, believing that well-crafted custom stair designs have dramatic effects on the utility and beauty of interior spaces. Incorporating a client’s vision and style with engineering needs Traditional StairWorks takes the time to create a functional and aesthetic stairway that truly evokes what the property owner envisions within local building code requirements. Imagine having to use a long winding flight of stairs that has no railings, not a very pleasant thought. Stair rails serve an important function by providing a safety barrier, but they can be so much more. 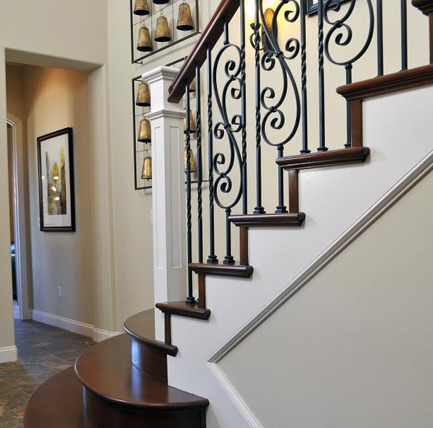 Installing custom stair railings can add sophistication and style to a room while providing safety. Traditional StairWorks can build beautiful railings for platforms, shallow rises as well as stairways. Traditional StairWorks is expert at custom railing creation for both household and commercial construction. The team at Traditional StairWorks accepts project requests from property owners and contractors in the Grover Beach, Pismo Beach, Arroyo Grande, San Luis Obispo, Cambria, Morro Bay, Paso Robles, Santa Barbara, and Santa Ynez areas, with a wide selection of options for foyer, deck, patio, or staircase. During the remodel or building process several factors need to be considered when choosing a staircase from design and style to functionality and budget. Traditional StairWorks delivers quality products at affordable prices and goes out of their way to make the staircase building and installation process smooth and hassle-free. A staircase is a focal point of your home or office space, it not only connects building floors but it is used by people daily. A staircase should be both functional and beautiful. Traditional StairWorks strives to uphold standards of excellence in the design and construction of their staircases.